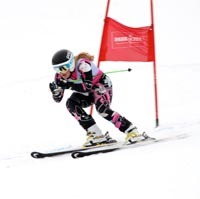 With her best finish, a fifth place in slalom Thursday, Wood River High School sophomore Haley Cutler completed a four-day series of top-10 overall finishes in each race during the Eric Hays Memorial Open Series event at Park City (Utah) Mountain Resort. Cutler, fourth of 43 in the U-16 age class, finished less than two seconds off the winning pace of Park City Ski Team’s Jessica Kelley. She was one of 28 Sun Valley Ski Education Foundation racers in the four-day series of races. Cutler’s other finishes were sixth and seventh place in giant slalom (5th/4th U-16), and seventh in last Wednesday’s first of two slaloms (4th U–16). Many of the younger SVSEF skiers in U-16 (ages 14-15) and U-14 (12-13) classes met the challenges of Payday Run last week. Will Snyder clocked his best result in Thursday’s slalom, second of 47 boys in the U-16 class and 14th overall. Up in Canada at Panorama Mountain Resort in British Columbia, two older SVSEF racers competed in Thursday’s Van Houtte Cup giant slalom. Kipling Weisel placed 11th of 47 in the U-18 (ages 16-17) class and 43th overall of 70 finishers. KJ Savaria was 13th of the U-18 racers (45th overall). - U-16 boys: 2—Will Snyder. 12—Taylor Cooper. 13—Stockton Troyer. 14—Jay Fitzgerald. 17—Austin Savaria. 18—Trenor Gould. 23—Yuri McClure. 25—Duncan Fuller. 27—Patrick Riedinger. 29—Emmett Say. 30—Gavin Shipley. 34—John Blackburn. 36—Wyatt Smith. - U-16 girls: 4—Haley Cutler. 7—Samantha Busby. 15—Madison Milgard. 19—Josie Allison. 23—Royce Rheinschild. 24—Alexandra Black. 29—Poppy Ellie Vorse. - U-14 boys: 1—Noah Leininger. 3—Cooper Dart. - U-14 girls: 3—Katelyn Rathfon.